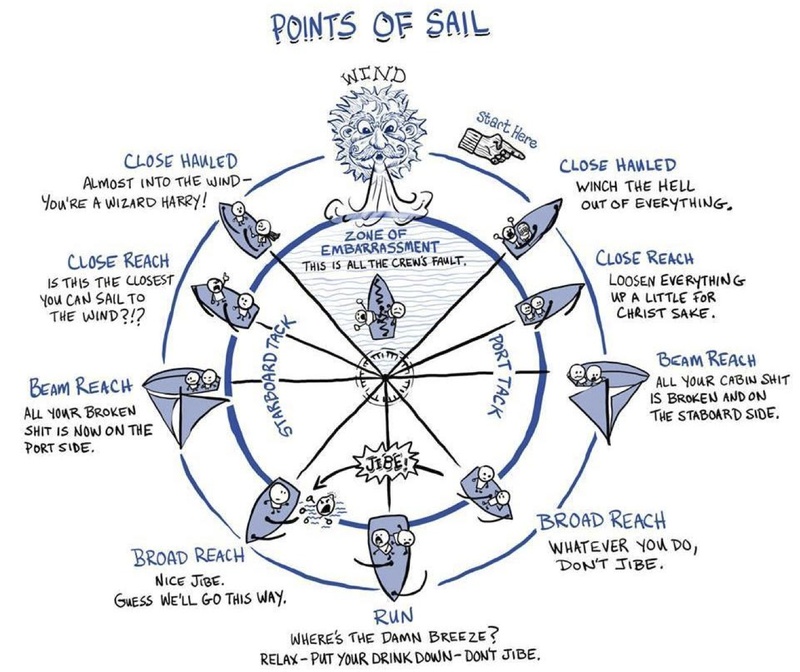 People have been sailing for thousands of years and flying since 1903 (Wight brothers), but it is incredible that just recently, it was explained completely how it is possible to fly/sail with Claes Johnson’s New Theory of Flight from 2008. It is possible to sail upwind (against the wind) by beating with close hauled sails. 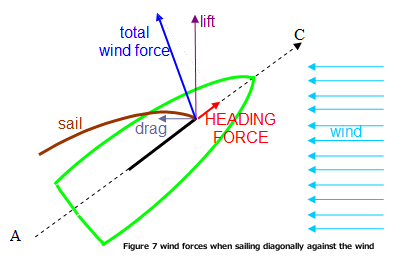 In beating both the sail and keel act like airfoils generating forces of lift L and drag D at certain angles of attack of the sail to the wind direction and of the keel to the the motion of the boat through the water. A forward component of the lift from the sail (drive) propels the boat forward, while the side component (heeling) is balanced by lift in the opposite direction from the keel. The drive is balanced by drag forces from sail, keel and hull. The key to uncover the mathematical secret of flight came from a correct resolution of d’Alembert’s paradox form 1752. The new flight theory directly reflects properties of Navies-Stokes solutions. 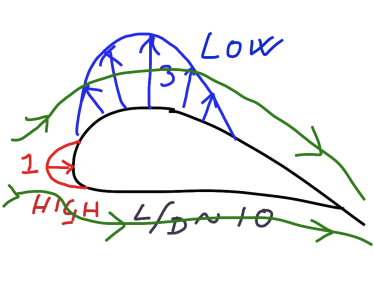 Correct explanation of lift by perturbation of potential flow (left) at separation from physical low-pressure turbulent counter-rotating rolls (middle) changing the pressure and velocity at the trailing edge into a flow with downwash and lift (right). The flow is incompressible with small skin friction and thus can only separate at stagnation at the trailing edge (before stall). Main lift is created by low pressure (negative) on top of the leading edge of high speed flow in accordance with Bernoulli’s Principle. Main drag is created by high pressure (positive) on the leading edge by low speed flow in accordance with Bernoulli’s Principle. Lift and drag from the leading edge are preserved by a specific flow separation pattern at the trailing edge with alternating high and low pressure with zero mean. Low pressure (blue) on top of the leading edge giving lift L about 3 times as big as the high pressure at the front of leading edge giving drag D resulting in blue area/red area = L/D > 10. The flow leaves the wing at the trailing edge without high/low pressure in a downward motion as downwash creating lift as reaction force. A book – The Secret of Sailing can be downloaded in pdf format HERE!